Three Oaks is east of Chicago, on the east side of the lake. There are some very interesting plays being performed here besides ours. If you're anywhere close by, this weekend will be glorious! If anyone is going to be in Shanghai or Nanjing during this time (or have friends or relatives living there) with interest in seeing us, email me. I'll be taking photos and writing about the trip. Check back for blogs, or sign up on my mailing list! It's available on every page. Nancy Scott hosts an in-the-round songwriter night once a month. This time she's asked me, (Darcie Deaville), Kiya Heartwood, & Dana McBride. And Nancy, of course. Great food, drink & appetizer specials, company! Going to the Haifa English Theatre's website (it's the English version) and also going to the Woody Sez site will give you the information you need. Going to the Tzavta Theater's website (it's the English version) and also going to the Woody Sez site will give you the information you need. Going to the Khan Theatre's website (it's the English version) and also going to the Woody Sez site will give you the information you need. With Woody Sez, I often don't know the details. I show up in the city they tell me to, I roll up my sleeves and get going! Anyone in the area who is interested should go to the Guthrie Center's website, or WoodySez.com. They'll both have different and valuable information. Snazzy Productions has brought us back to Santa Cruz once again, this time our the release of our new CD, "Home and Deranged." There will be CDs and T-shirts galore. Ahh! Winters in the spring! And it will be our California release of our new CD, "Home and Deranged." We have new t-shirts, too! Please join us for a CD release celebration with our dear friends at Waterloo Records. Bring your mother! We have a new CD, "Home and Deranged." Join us at Austin's premier listening room -we'll play new & old songs, and have new T-Shirts as well as the new CDs. I'm not sure exactly what time Tish & I play at Poodie's, but anyone who's been there knows the deal. It's it's own special place with their own special time zone.... just the two of us. It'll be fun! We haven't been at the Duck for a long time! So we're especially pleased to be back, and we'll have our new CD with us! Note it's an early show. We won't have the new CD to sell there, but so very, very soon! I believe we are taking orders, CDs can be sent to anyone who pre-buys on May 3rd (or so). And you get an extra little something for buying up front. The Bugle Boy is an excellent listening room, just a lovely hour + drive from Austin through the bluebonnets. Anyone who lives in and around LaGrange enjoy a fine community. We always have a great time playing here, reservations are highly recommended. Jeff Plankenhorn, Scrappy Jud Newcomb, John Dee Graham with special guests sing it like it is every Sunday. Proceeds to benefit Capital Area Food Bank. If anybody's been spreading rumors about some rogue Hallowe'en takeover of the Cactus Cafe this Saturday, we hereby disavow any knowledge of it. We're just going to show up and play. Some of the citizens may appear in unconventional garb and affecting ghoulish behavior. It'll just be business as usual as far as we're concerned. Cactus Cafe this Saturday, October 27, at 8:30 PM. Doors will open at 8:00. 2247 Guadalupe Street in the UT Union. A new place for us to see old friends. Miss the Lizards at Strawberry? C'mon out to Murphys! Eureka! At last we play this venue in Folsom, CA! "Kuumbwa" means "Here come the Lizards again." Our first Califoria foray of 2012 begins at this famous venue. The show runs at A.R.T. from May 5-26th, with Saturday, Sunday, and Wednesday matinees at 2:30. No Monday shows. Check website or call for ticket prices. The show is recommended for ages 8 and up, and the running time is 90 minutes with no intermission. Not a lot of info to give you yet.. although I've played here before with both the Lizards and Charles Thibodeaux and the Cajun Aces. They have a regular concert series that's open to the public. "This Land is Your Land" is an educational play, and could be considered the predecessor of "Woody Sez." Also with a musical acting cast of four, we did this throughout Austria (also in Prague and a few towns in Italy) for six months during the 2005-2006 season. This time we'll be in public schools in Tulsa for four days. This time we'll be in public schools in Tulsa for four days, March 5-8. The Festival Musik und Politik is in Berlin. It's at least a week long, and looks incredibly interesting! Our "Woody Sez" gig here is a concert, rather than the play, so the four of us aren't limited to singing pieces only from the show. Tom Morello and Wenzel & Band also share the evening with us. The Kesselhaus link above is our venue. (You need to scroll down to the bottom of the page to see our listing). Here and here are other links to the festival, with different information. It's the Lizards annual fling here at the McDavid Studio in Ft. Worth. I missed it last year, and look forward to seeing everyone there again! Woody Sez was nominated for best musical of 2011 in London's West End Theatre District. Now we're back in the UK, presented by the Celtic Connections Festival. 5 nights of shows, from Jan 29-Feb 2, are mostly already sold out- so if you want to see us, get your ticket asap! What do I do in Woody Sez? Look at a slide show here. Or click here to read Andrew Rilstone's blog, which is a combination of a review and description of the show in London. He is reasonably accurate in his description, and pulls no punches. He did make a mistake - crediting Andy Teirstein with the "Jolly Banker" scene instead of me - as Lefty Lou. He also mentions the "narrator," when referring to Woody. And yes, he does narrate...in a sense, in the first person. However we (the cast & writers) believe the truer narration is musical, having me play & sing verses of "Tom Joad" as the story moves along. "Darcy Deaville transports the audience right back to a barnstorming government-camp Friday night party with her fiddle…"
"Darcie Deaville makes an excellent Lefty Lou and seems most confident when giving full range to her hearty voice, which is appropriately that of a true folk singer rather than a musical theatre actress". ” Darcie Deaville is excellent as the irrepressible Lefty Lou"
Full House, opening night for us in Glasgow! When we have a great audience who gives back to us, we give the audience a great show. That give and receive is so much fun! Looking forward to the next four nights! Darcie will be bringing some top notch Austin musicians to join her! My only question is- what does P.W.Y.C. stand for? Don't have a whole lot of info for this- It's in downtown Keokuk, which is a three hour drive from St. Louis. What's really fun about this is- it's a reunion- I haven't played with Igor and the band for probably close to 25 years! Igor is a kick- you can check him out here. This is a 10 year anniversary party for the Blue Corn record label. Artists Ruthie Foster and Hadden Sayers will play songs from their new releases, and the Austin Lounge Lizards' set is from 8-8:30. This is a series of house concerts called Home Routes in Canada. I'm on what's called "The Cherry Bomb Circuit" primarily in Northern BC. I start in Hinton, AB, and make my way to Prince Rupert over 14 days. The countryside and the people make for quite a different lifestyle for me from the Woody Sez play in London just previously! Come back here to this page for updates on details (around the 1st of March)- or contact the hosts to find out the starting time and cost. Location in Smithers is TBA. Sadly, the regular hosts have a family emergency going on. If you are in Smithers and are trying to find where we will do the show, contact Josey at Home Routes. We're going to do an afternoon concert for all those who have a full work and school week ahead of them! Make sure to let Shannon know if you like this new concert time! Contact Jay Shumaker in Vanderhoof, BC for details and reservations. the home of Jim and Lucy Beck- or maybe a store? This show presented by "Concerts in the Gallery" is held at the Dawson Creek Art Gallery in a refurbished grain elevator. The acoustics are supposed to be AMAZING! We love reservations! And walkups are welcome. Walkups welcome, but please reserve if you can! Email Sue and Bruce at sue_storoschuk@yahoo.com or call them at 780 865 5128. Dynamo Helen Kwiatkowski is the most dedicated fan I know. She works hard to make things happen, and they DO! The Pre-Show Soiree' is from 6:30 - 7:30 p.m.
David Warren has graciously offered to host a house concert in Toronto. His doors will open at 7:30. Please email David for more info and to RSVP. As I get more information, I'll post it- for instance- what part of town he lives in! Song circle- Nancy Dutra, Darcie Deaville, and TBA - 8 PM ? I'm not too sure what time we really start. I am very much looking forward to playing here! Call the phone number for details, we don't have any other info (at least right now) to give you regarding tix. The Austin Lounge Lizards - 8:00 p.m.
Special deal for advance ticket reservations Everyone who reserves their seat in advance will get a free download of any song of their choice Darcie has recorded. The Bugle Boy is a great weekend destination in the small Texas town of La Grange. Folks will drive from Houston, Austin, San Antonio and even Dallas to hear a performance in this room. Many folks have said, "This is the best listening room in Texas". Overnight accommodations and restaurants are listed on their website. FREE STUFF FOR THOSE WHO PLAN AHEAD! People who reserve in advance will get a free download of an unreleased new recording of "Hillbillies in a Haunted House." The first 25 people (couples count as one) in line at the door will get a raffle ticket. The person whose ticket is drawn wins an item off our merchandise table. The last Friday of each month I play with Carson McHone- who plays every Friday at the same time. Price: I don't believe there's a cover. Carson is a young, up and coming singer songwriter (she also plays fiddle and mandolin)! She's doing every friday at the Hole in the Wall, and I'll join her the last Friday of each month. Carson doesn't have a web presence yet, but she will soon! This date and event is not on their webpage- as far as I know it's happening! I'll see what's up, but we're planning to be there! I'm not sure who the 3rd person is, but I'll let you know about that, too! White Ghost Shivers play at 10! Millard Lampell created the template for "Woody Sez" in 1956. He put together "CALIFORNIA TO THE NEW YORK ISLAND," a program of Woody's words and music performed as a tribute by a group of some thirty performers, players and pre-school dancers. Fifty-odd years later David Lutken, Nick Corley, Darcie Deaville, Helen Russell and Andy Teirstein weave Woody's songs together with excerpts and anecdotes from his books and the columns he wrote for the "PEOPLE'S DAILY WORLD" to create a concert narrative - a biographical, political, and personal portrait of one of the world's immortal troubadours. 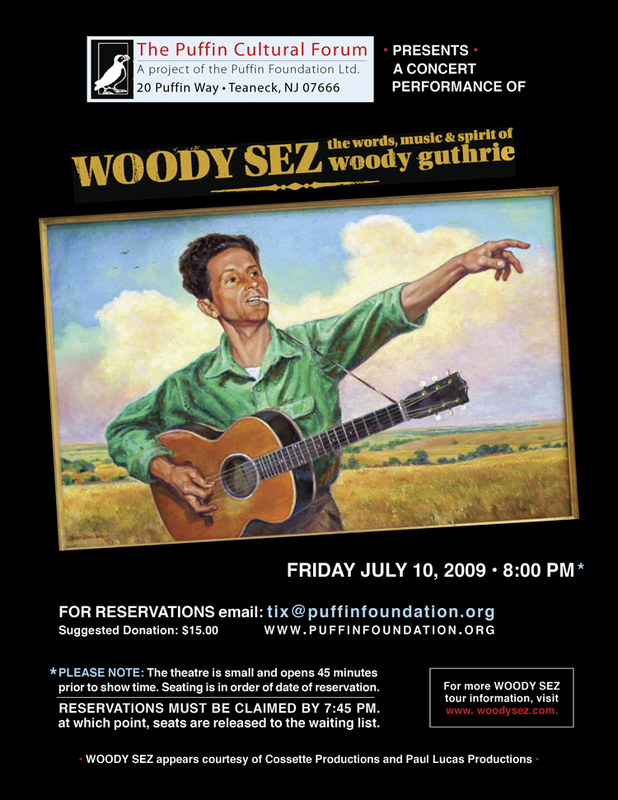 Woody Guthrie is the original folk hero — a man who, in the 30’s and 40’s, transformed the folk ballad into a vehicle for social protest and observation and, in so doing, paved the way for Bob Dylan, Bruce Springsteen and a host of other folk and rock songwriters who have been moved by conscience to share experiences and voice opinions in a forthright manner. Fueled by a boundless curiosity about the world, the colorful life he led became as legendary as the songs he wrote such as, “This Land is Your Land.” —Rock and Roll Hall of Fame. Doors open 6:30 p.m., show starts at 7:30 p.m.
$15 per person requested cash donation, ALL monies go to artist!! CD's and other merchandise available from artist!! This is a LISTENING show, NO talking during performance, please! BE RESPONSIBLE! If you drink, don't drive! Come and hear the up and coming Carson McHone! She's great. In and out of the box mando chord patterns, and an overview of the instrument’s role in a band. We’ll cover how you can add texture and color to an arrangement, playing melodies (and fiddle tunes), working out solos, singing while playing, and improvising. Guitar - same way, exploring beginning and intermediate back up, flatpicking and fingerpicking. Everyone can lead a song- (unnerving for some!) and following is something we can all continue to improve and experiment on. Other instruments are welcome. It's preferable if you email me with a reservation, but it's OK if you just come at 1:00 and join us! It's a potluck - come at 5:30, hang out, eat... I'll play from 6:30-8:30 and we'll have a song circle/jam afterwards. You're welcome to join in! In and out of the box mando chord patterns, and an overview of the instrument’s role in a band. We’ll cover how you can add texture and color to an arrangement, playing melodies (and fiddle tunes), working out solos, singing while playing, and improvising. Guitar - same way, exploring beginning and intermediate back up, flatpicking and fingerpicking. Everyone can lead a song- (unnerving for some!) and following is something we can all continue to improve and experiment on. Other instruments are welcome. It's preferable if you email me with a reservation, but it's OK if you just come at 1:00 and join us! Sundays Nov 15, 22, 29. Take a Right on Del Webb Blvd. Take the second Left into our Village Center . The Austin Lounge Lizards will play a concert and workshops. Darcie will also be doing some fun workshops (solo) with Peggy Seeger and other old friends from Canada. Interesting topics! This is one of the best restaurant/club gigs around. And having Mary and Louise pay with me really makes it top notch. Sign up by emailing darcie@tallerdog.com by picking a workshop below. We won't be doing all of them, each workshop will be about 2 hours, I'll see how many people are interested in which ones, and we'll go from there. —How to play in a band, and how to be asked back to your favorite sessions- Anyone who plays guitar, fiddle, mandolin, bass, percussion, piano (you'll have to bring your own keyboard), or sings... and any other instrument I haven't mentioned - is welcome. Nobody will be left out! and I lead this workshop with tips on leading/fronting a band, and the do's and don'ts of back up. Wondering what singers expect from each member of the band? How much is too much? What's the important thing to be paying attention to? —Fiddle - country, Appalachian old time, Cajun, blues, rock & roll, and more! —Mandolin - "out of the box" chord patterns, and an overview of the mandolin's role in a band. There is always something else you can do to add texture or color to an arrangement. —Want to play violin, viola, cello, or upright bass, but don't know how to start? Give me an hour, and you'll know what to do next, how to go about it. Already have one but haven't gotten started? This is for you, too. —Playing with your family - the best and the worst parts of playing with people you know all too well. I'll help you get the best results. Woody Sez in the UK. By going to www.woodysez.com you can find out all the info you want about the show, and the Komedia link for tickets and location. Woody Sez in the UK. By going to www.woodysez.com you can find out all the info you need. Woody Sez "brushup" before heading over to the UK! I don't know the time or the price, but anyone can go to www.woodysez.com and find out all the info. Woody Sez plays primarily in Europe, and it's special! If you are anywhere near NYC, this is a rare opportunity for you to see it.